The TWiV hosts review an analysis of gender parity trends at virology conferences, and the origin and unusual pathogenesis of the 1918 pandemic H1N1 influenza virus. The Masters of the ScienTWIVic Universe discuss a novel poxvirus isolate from an immunosuppressed patient, H1N1 and the gain-of-function debate, and attenuation of dengue virus by recoding the genome. The TWiVerinoes discuss the potential for prion spread by plants, global circulation patterns of influenza virus, and the roles of Argonautes and a viral protein in RNA silencing in plants. The TWiVodes answer listener email about hantaviruses, antivirals, H1N1 vaccine and narcolepsy, credibility of peer review, Bourbon virus, influenza vaccine, careers in virology, and much more. Vincent, Alan, Rich and Kathy review how human placental trophoblasts confer viral resistance via exosome-mediated delivery of microRNAs, and isolation of the first human influenza virus in 1933. Vincent, Rich, Alan and Kathy review aerosol transmission studies of influenza H1N1 x H5N1 reassortants, H7N9 infections in China, and the MERS coronavirus. Vincent, Alan, and Rich review the making of a virulent poxvirus by insertion of the gene encoding IL-4, and severe 2009 H1N1 influenza due to pathogenic immune complexes. TWiV 95: Does a virus shift in the woods? Vincent, Dickson, Alan, and Rich consider the end of the influenza H1N1 pandemic, dengue in Florida, vaccinia virus infection in Brazilian monkeys, and viruses in the faecal microbiota. 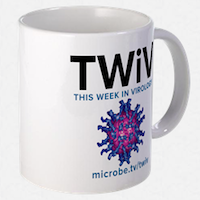 TWiV 89: Where do viruses vacation? Vincent and Alan review recent findings on the association of the retrovirus XMRV with ME/CFS, reassortment of 2009 pandemic H1N1 influenza virus in swine, and where influenza viruses travel in the off-season. Vincent, Alan, and Rich revisit circovirus contamination of Rotarix, then discuss poxvirus-like replication of mimivirus in the cell cytoplasm, and whether seasonal influenza immunization increases the risk of infection with the 2009 H1N1 pandemic virus.